A taste of my own medicine…and a new PB! Come to me with a conundrum, and my advice is simple: “listen to your heart.” It is such easy advice to dole out but, as I learned on Friday, not always easy to act on. 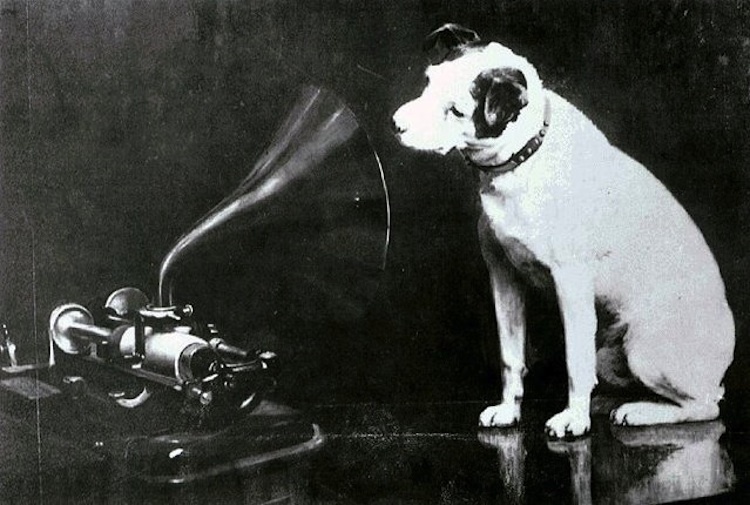 “His Master’s Voice” – Painting by Francis Barraud featuring “Nipper” and an Edison Bell cylinder phonograph. A couple of teammates and I arrived at the University of Toledo on Friday afternoon ready for a track meet. Conditions were less than ideal, but I’ve been a heptathlete long enough to have learned how to accept anything beyond my control and refocus. I take pride in my ability to adapt. But immediately I knew that I wasn’t feeling it. I even surprised myself by being able to articulate to my companions the clear message that the voice inside was broadcasting. While I do my best to honour this voice, on this day, in this situation, it just didn’t have the same pull. It was the strangest feeling. I was torn. I felt compelled to race, fully aware that it was my head commandeering the vessel while my heart hunkered down below deck, clearly wanting no part in it. My head was searching for a logical reason to back up my heart, but it couldn’t find anything concrete so it maintained course and I continued along in my warm up. Just as the hurdle crew was being summoned to set up the hurdles, I finally made the executive decision and marched myself inside to scratch from the race. I immediately felt peace, like my chakras (or some other spiritual things that get aligned) were aligned. Racing in Toledo was not setting myself up for success. Between the drive down, the weather, the track delays, and most importantly my heart’s stubborn refusal to participate, the risks simply outweighed the rewards. Plus I was also scheduled to race the next day. Not running on Friday got the ship’s entire crew on the same page, and further, it made me hungry to run on Saturday…really hungry. Running hungry seems to work. I set a new personal best of 57.98 seconds the next day in Akron, Ohio, with a few hurdles still to tidy up. A quick week of training and then I head to Atlanta for the weekend. View full results from the Campbell Wright Invitational in Akron.